Most of the information in this book will be useful to health workers and village rehabilitation workers who see many disabled children. Some of the information will also be useful for the family of a disabled child. However, a family with one disabled child will usually not need, or be able to afford this whole book. It has information about so many different disabilities, that parents may have difficulty finding the information that applies to their child. Also, learning from a book is often not the best way to learn something. 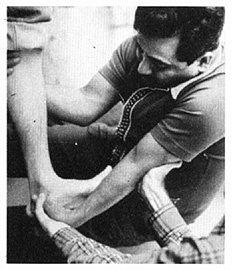 A lot of methods, aids, and exercises can be learned more easily from other persons, through watching and through guided practice. But after a village worker has taught parents how to do certain exercises, or shown them an example of a homemade aid, printed instruction sheets with clear drawings can be a big help. Sometimes they can make the difference between whether the recommendations are followed at home, or not. There are certain pages or parts of this book that you may want to give to families after you explain and teach to them selected exercises or activities. For example, to the family of a girl with arthritis, you may want to give some of the "Exercise Instruction Sheets" at the end of Chapter 42, and the "Information Sheet on Aspirin" on Page 134. You may also want to give them pages from Chapter 16 on arthritis, and to mark the exercises and activities that are important to their child. To the family of a young child who is slow to develop, you may want to give pages from the chapters on child development and early stimulation activities (Chapters 34 and 35). For a more advanced child you could give the family material from the chapters on self-care (Chapters 36 to 39). Depending on the interest and reading ability of the family, you may want to give them a whole chapter (or chapters) about their child's disability. For example, the chapters on cerebral palsy (Chapter 9) or deafness (Chapter 31). An older child who is paralyzed from a broken back might appreciate having a copy of the chapter on spinal cord injury. Letting him and his family take home the chapters on pressure sores and urine and bowel control could even save his life! His family may also want to take home plans for making a low-cost wheelchair, to see if the carpenter and blacksmith in their village could make one. On any page or chapter that you give to parents, some of the information or suggestions will apply more than others to their child. We suggest that you circle the activities or suggestions that would be most helpful to the child in his present condition or level of development. You could also put an "X" through anything that should not be done or might be harmful for that child. Here is an example. If the child is spastic and beginning to sit, the first 3 activities on Page 307 can help her to improve balance and to develop controlled body movement. So circle these. The next 3 activities will still be too difficult and could increase spasticity. Put an "X" through these so the family does not do them. Making copies of pages can be costly. Or you may have to go a long way for them. Also, there will be times when you want to give a family written suggestions or drawings that you have not copied in advance. 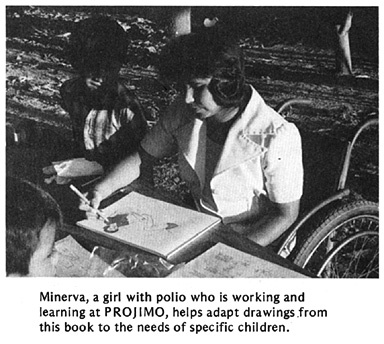 If someone prepares a set of large drawings in advance, perhaps a disabled child who visits the village center can trace the drawings of exercises he needs to do at home. Giving the child this responsibility from the start makes it more likely that he will do the exercises at home. If you make your own 'hand out' sheets (instead of just copying pages of this book) you can use the local language and villagers' way of saying things. You can also adapt the drawings to the hair style and dress that people feel 'at home' with. Whatever you do, try to keep both your language and drawings simple and clear. Avoid unfamiliar words. Also, try to think of ways of adapting exercises or activities to the local situation. you might add a drawing like this one. This will encourage parents to think of ways to do exercises that involve their child in the life and action of their community. Guide them in doing it until they do it right and understand why. Then, give them the instruction sheet and explain the main points. These steps are explained with examples and drawings on Page 382. As much as you can, try not to use this book for giving exact instructions on how to do things. Instead, encourage everyone to use it as a source of ideas, in order to figure out better ways to help their children lead fuller lives and manage better in their communities. 1. SHOW other people how to do things. Village rehabilitation workers and family members learn in an outdoor class. Here they practice a hip-stretching exercise. Behind them, drawings on the blackboard show which muscles are stretched. 2. Then help them LEARN BY DOING it themselves-under your guidance. 3. And to help them remember, give them a DRAWING or INSTRUCTION SHEET. IMPORTANT: Try to help people to understand not only what to do, but also why. Perhaps you can hold classes using information from this book. Try to combine hands-on practice with discussion of principles and reasons.